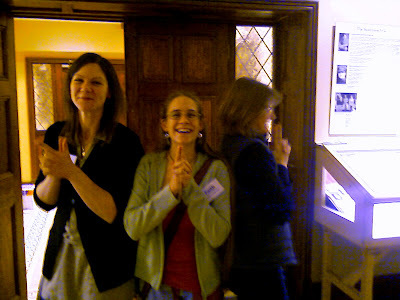 ...there are actually two Rorate Caeli blogs. Well, actually Rorate Caeli is the famous blog... it comes up in uppercase letters on the tabs, with the fancy "Æ" which I can rarely be bothered to find in the character map. Rorate Coeli is the less well-known blog on Wordpress, written by Michael Skaggs of Indiana. I know the words are from the Introit to the Mass for the Fourth Sunday in Advent... however, not being a Latin scholar, I have no idea why one blog has "caeli" and another "coeli" - any suggestions? Either way, remember to visit them both! I hadn't spotted John's blog before - it's well worth a visit. John is a graduate student and tour operator living in Rome. I love one of the phrases he uses: to know history is to be Catholic. Twitch of the mantilla to Fr. Ray Blake. Looking at Site Meter reveals that quite a few people arrive at this blog because they were researching "mantillas". If you want to know more about the whys and wherefores of wearing mantillas, you can see my previous posts on the topic: Made-to-Measure Mantillas (I give details of a woman who makes mantillas, really nice ones, in the com-box), Wearing the Mantilla (with a link to an article by the Latin Mass Society) and More on Mantillas. Heheheheheh... couldn't resist that title! The Mass was covered live by EWTN and BBC2, and the Catholic Herald had a twitter-thingy going on a special Installation Page on its website to keep everyone informed. Impressive stuff. My one gripe was that the "Sign of Peace" was included - it was a touchy-feely fest for the congregation, and even the priests concelebrating had a bit of a mill-around. In the beginning, Vatican news was reported by special courier... like the chap who brought news that John Fisher was to be made Cardinal, upsetting Henry VIII so much that the king declared he would ensure that Fisher would not have a head upon which to set his new red hat. Then came the Vatican You Tube channel... and finally, the Pope is on Facebook! Unfortunately, the Holy Father will not, I suspect, be adding me to his list of friends. I will, however, be able to send picture postcards with snippets of the Pope's speeches. Glancing through my favourite blog updates on Google Reader, I spotted a few references to Paul Inwood being awarded Pastoral Musician of the Year. I did a double-take... Paul Inwood of Gathering Mass infamy? Pastoral Musician?? Shorely shome mishtake, Mish Moneypenneh?! Perhaps this is an acknowledgement of what poor music has done to vocations. James and Ella Preece have just had their second baby - a girl. No further information or pictures yet, but that is hardly surprising! James recently bearded the lions in their den when he went on a TV chat show to defend the Holy Father's teaching on HIV/AIDS and condoms. ...Unfortunately, a recent game link has been added: nom nom nom 4 fud. In this, you aim your kitty at various cat biscuits, launch it by clicking on the tail, and watch as the cat munches up the biscuits for points. 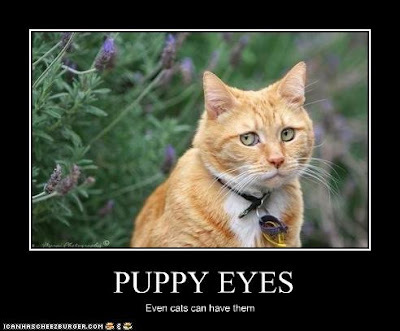 Big bags of catfood, cat baskets, water bowls and brooms make up the obstacles to be avoided. There are extra points for balls of wool and cheezburgers provide extra "lives." It is also extremely frustrating, as the kitty doesn't seem to follow the laws of physics after the first two (simple) levels. I have launched my cat at exactly the same angle and strength on a particular level, and the cat seems to scoot off in a completely random manner... eating and missing biscuits in an infuriatingly idiosyncratic fashion each time. As a result, my highest score has been only 31500... more by luck than judgement. Leutgeb, in common with many musicians, is mathematically-minded. She has noticed that she is very close to achieving 10 to the power 4 hits on her blog, Bara Brith... that's 10,000 to the (un-mathematical) likes of me. It is fascinating to see the preparations being made for the Installation of Vincent Nichols as 11th Archbishop of Westminster. The Diocese of Westminster "webteam" started up a blog to show all the work that's going into the liturgy and the whole "takeover process"... a very media-savvy move, I think. 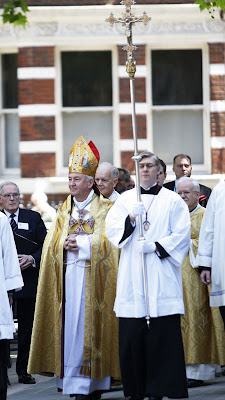 The Friends of Westminster Cathedral decided to present the new Archbishop with a set of new vestments. When I first read the announcement, it did occur to me that this could be ghastly - visions of "fuzzy-felt" bunches of grapes kept floating before my eyes, and mention of griffins just brought the old Barclays Bank logo to mind. The Installation Blog, however, put up some pictures of the vestments being made, along with a description, and there's not a grape, felt or otherwise, in sight! The griffin design mentioned is presumably woven into the fabric itself. The overall effect is one of elegant simplicity. This is not, by the way, the same as the "simplicity" claimed by the awful fuzzy-felt vestments of the 1970s - that was a stripping out of all that was beautiful, of all that was perceived as "not relevant" or "not modern." There is an excellent article by Christina White in the Catholic Herald on the creation of the new vestments. 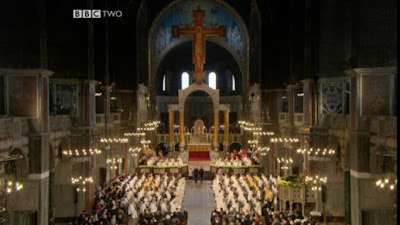 I was extremely interested to note that the ceremony of the Reception and Installation of the Archbishop of Westminster will be carried out according to the ancient Catholic rite used in similar circumstances for the Reception and Installation of the Archbishops of Canterbury prior to the Reformation... one in the eye for all those trendies who decry the usus antiquior as dragging the Church backwards, perhaps? Taken together, this suggests that the winds of liturgical change (or a bit of a breeze, at least) might be blowing through the halls of Westminster Cathedral. Watch this space.